By Agus in Mobile. Updated on December 8, 2017 . We pick our favorite messaging apps for a variety of reasons, preferences and needs. But among all the available messaging app choices out there, when it comes to sharing large files, not all can deliver. Usually messaging apps limit the size of the image; this means that the outcome is not as good as the original. If the file you want to send is large and you don’t want the sent message to take a hit in the quality department, then you need the messaging app called Pibox. 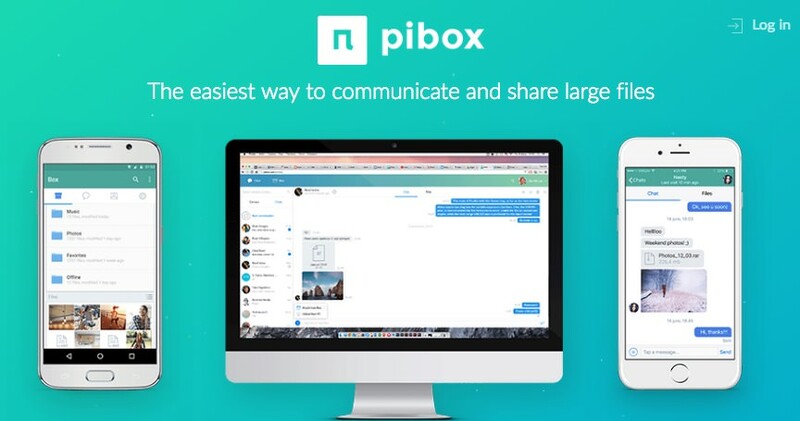 Pibox is a messaging app equipped with file-sharing superpowers. It lets you message friends and family via personal chatrooms or group chats. Currently Pibox is available as a web app as well as an Android app. The iOS version is coming soon (click here to be notified when it does). On the web app version, there are two main tabs: a Chat tab which contains chat history and your contacts, and a Box tab where all your files are stored. You can upload your files in the Box or directly to chat, no matter if it is a photo or video. Moreover, you can give your friends access to your files by sending your files in Box to friends on Chat. Via Pibox, you can share 4K videos and even RAW photos without loss of quality. From any open chat, just choose to attach the video or photo file from the Box, or upload it straight from your PC or phone. Alternatively, you can drag the file you want and drop it in to start sharing. All shared items will be tracked in a Files history which is accessible once you switch to Files mode. For file quality, it lets you send files in two modes: HD and non-HD. HD mode for when you want to send the file in high quality, or non-HD mode, in a time when connection is bad and quality isn’t really a top priority. 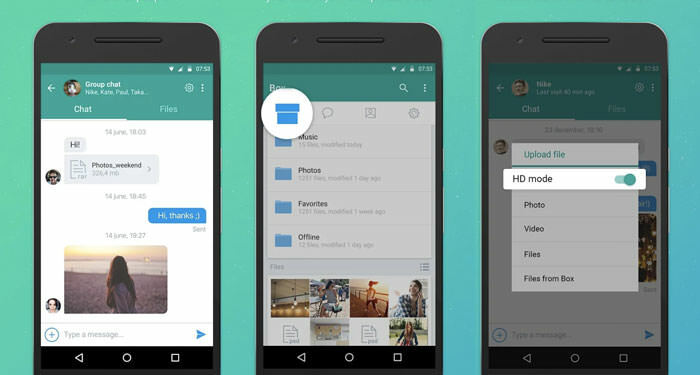 You can toggle between the two, and all your shared files will be stored in one place. Another interesting feature it has is that it lets you share files even with users who are not yet on Pibox. This is called Public Chat/Files. When you create a public chat, you will get a link to the conversation. Share this link with your friends and they will have access to the chat as well as the files. It supports almost all of the major formats! Whether it’s videos, pictures, documents or even installers, everything is sharable here. Pibox also claims that they have a faster upload/download speed than any other platforms like Telegram or even Dropbox. How much file storage do I get? Any file which you send to your friends using Pibox will maintain its original quality, which means your storage is going to be quite big to keep up with your shared files. You are given free cloud storage to manage and sync all your files. After initial sign up, you will get 3 GB storage for free. You can also get additional space, up to 1000 GB by inviting your friends to join Pibox. Each friend referral gives you about 3.14 GB so. Files sent using Pibox will maintain their original quality. You can get additional capacity up to 1000 GB by inviting your friends to join Pibox. Works well on desktop as well as a mobile app. Promises faster uploading and downloading speed as compared to other platforms (Telegram, Google Drive, Dropbox). No paid options, everything is free (at the time of writing). There is no browser bookmarklet available yet. You can only invite your friends via their phone number (no email invitation) which is a bit inconvenient. For mobile app, the service is currently only available to Andoid users. Desktop app has no folder/directory integration that allows manipulating files right from the folder (like on Dropbox).